No brand is more accurate, it's reassurance while you wait. The Clearblue Digital Pregnancy Test with Smart Countdown is the only test that reassures you that the test is working and when the answer is coming. 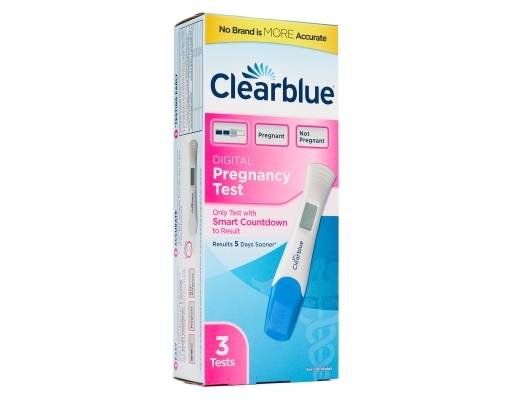 Only Clearblue has a unique progress indicator that counts down to the result and gives you confidence every step of the way until your result is digitally displayed in words. The wider tip makes it easy to use and the unique Floodguard technology inside helps keep excess urine from entering the device and causing test errors. The test also features a hygienic cap. Digital Pregnancy Test with Smart Countdown gives you reassurance while you wait for your result and an accurate digital reading even in early pregnancy. 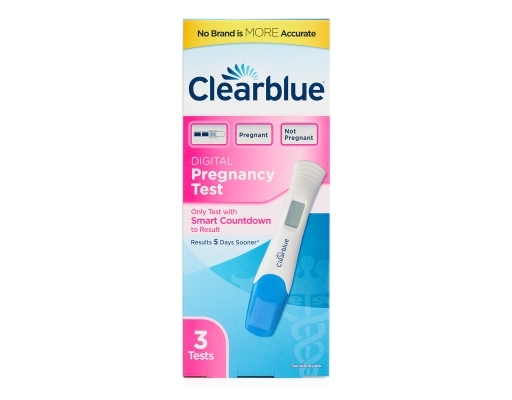 • Reassures You the Test is Working: The only pregnancy test that counts down to the result. • Get Your Answers in Words: Clear digital results in WORDS means no interpreting lines, and an accurate reading at an emotional time. • Designed to Reduce Errors During Testing: The 'no mess' wider absorbent tip and integrated Floodguard help reduce the #1 reported cause of user error by over 70%. 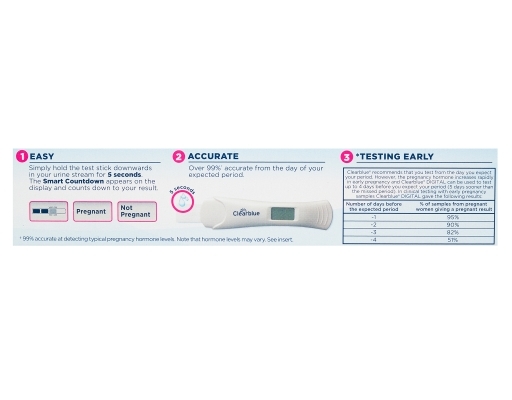 • Accuracy you can trust: The test is over 99% accurate at detecting pregnancy from the day of the expected period. • Can Test 5 Days Before your Missed Period: Sensitive enough to be used 5 days sooner than waiting until your missed period to test.